The Glock series of pistols is probably the most versatile and widely used range of pistols across the globe. From full-sized pistols to sub-compact variants, Glock has almost everything to offer in a handgun. But even after all its perfection and precision, the Glock pistols still require an important upgrade: a trigger. Having a good trigger for the Glock has its advantages and it makes an already near perfect weapon invincible. Here, we’ll learn the benefits and considerations of upgrading your Glock trigger. We will also review some of the best Glock triggers available on the market so you don’t have to struggle to decide which are the best on the market. The Glock is widely used for EDC, self-defense, competitions, and in law enforcement. But those who use Glock pistols know that the trigger has a heavyweight pull. Upgrading the Glock trigger reduces the pull weight from the factory 5.5 pounds to a lesser number. This helps with proper alignment and hence, accuracy. Another important benefit of upgrading the trigger is the reduction in slack. The significant pre-travel time of the Glock pistols makes shooting a bit difficult. Especially in strenuous situations. A smoother trigger pull also ensures easy shooting without moving or adjusting the sights. Finally, a very advantageous result of upgrading the trigger is a quick reset. An upgraded trigger will reset quickly, which allows for quicker follow-up shots with more accuracy. But even after upgrading the trigger, it is important to practice with your weapon, so you can handle it properly under different types of situations. Glocks are among the most durable handguns and so are their triggers. Always look for a trigger with durable construction, preferably aluminum or some durable composite. Having a solid trigger ensures reliable operation under all circumstances. The trigger you’re using to replace the factory one must be easy to install. Most triggers available on the market feature drop-in installation. So you can simply remove the existing trigger and slide in the new one. Check for all the desired functions in a new trigger before using. Look carefully at the pull weight, pre-travel, and over-travel time of the trigger, and evaluate these figures according to your needs. Also keep note of the reset time of the trigger, which allows you to take quicker follow up shots. Always make sure to check if the new trigger is compatible with your Glock model since there’s no point in buying a trigger that doesn’t fit your weapon. For example, a trigger designed for a Gen 4 Glock won’t work with a Gen 5. So compatibility is an important factor for choosing the trigger. 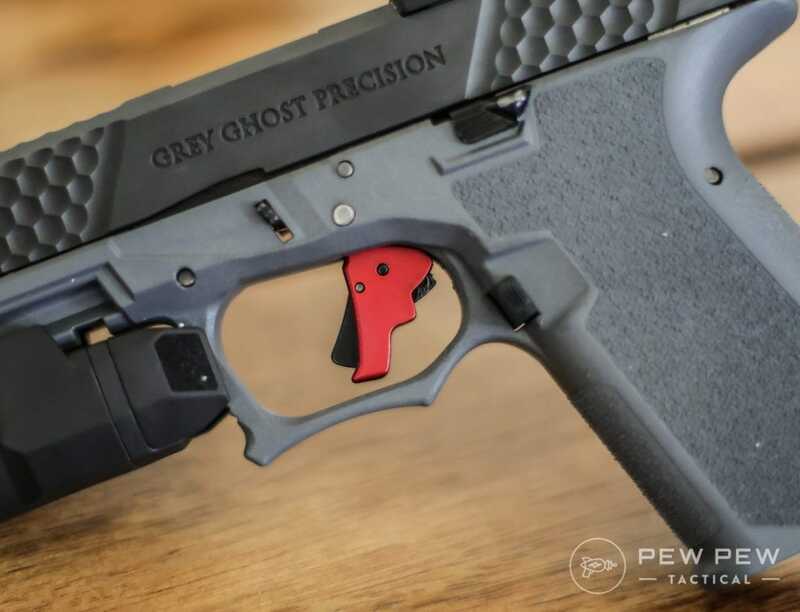 Based upon the above-discussed considerations and factors, we have come up with some of the best Glock replacement triggers on the market. These triggers have been selected based upon positive customer experiences so you don’t have to be skeptical before buying one. This crisp and robust Glock trigger from Apex Tactical is exceptional and according to us, is the best replacement for your Glock trigger. The trigger is a perfect functional enhancement for your Glock. It features a durable aluminum-based body and a crisp trigger break to let you shoot with minimal effort and greater precision. The trigger has a reduced pre-travel and over-travel time compared to the original factory trigger. Apart from that, the trigger has a quicker reset, which allows you to take quicker follow up shots. Plus, the reset has the added benefit of an audible click. The center-mounted pivoting safety ensures that the factory safety measures work well. The trigger also has a lighter connector compared to the original factory trigger mechanism. The trigger assembly has a direct drop-in design to eliminate any serious gunsmithing efforts during the installation process.The trigger works flawlessly with all Glock Models in and under Gen 3, except for the G43 which has a slightly narrower frame. The trigger makes the Glock exceptional for competitions and range use. Apex triggers are known to have a consistent pull, so you can rest assured of its performance. The Apex Tactical Trigger for Glock fits all models and enhances the trigger function to extreme levels. The trigger is easy to install and looks aesthetically pleasing. Considering its price, the trigger offers good value for money. The Glock 43 is a subcompact and very concealable handgun in its class. Due to its size, the G43 requires a different size trigger assembly. For that matter, we have come up with this extremely useful aftermarket trigger from Overwatch Precision. 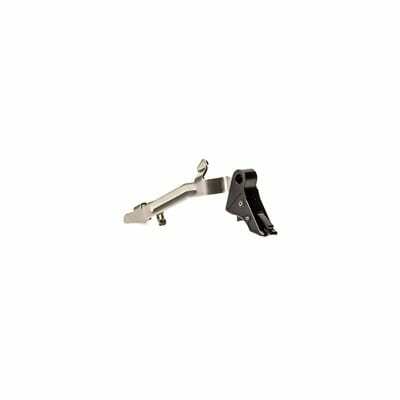 This trigger assembly features a metal-based design made from 7075 T6 aluminum, the same material used for making AR receivers. The trigger comes in conjunction with a 316 stainless steel bar. The trigger shoe has a flat-faced design which reduces the trigger reach by some margin. This is actually helpful for people with small hands. Plus, the shoe has a small indexing hook, which lets you feel the trigger for intuitive finger placement and controlled action while shooting. The trigger shoe and safety tab are both made from metal and are hard coat anodized to prevent rusting and corrosion. Overall, the trigger has a reduced pull weight, pre-travel and over-travel times, along with a crisp break for efficient performance. This trigger can also fit other 9mm and 10mm handguns so it is not only limited to Glocks, which is definitely a plus if you own multiple handguns. It is a direct drop-in trigger, so you won’t face any problems with installation. 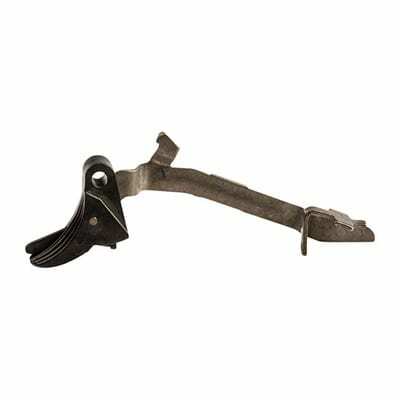 This trigger has a drop-in installation and a flat shoe with an indexing hook. It works with multiple handguns, which is a plus. But most of all, it works exceptionally well with the G43, which has fewer trigger options available on the market. Overall, the trigger is good for EDC and self-defense with the G43. The Glock 19 is a compact and widely used weapon by both civilian and law enforcement officers. It is quite good for EDC and concealed carry. If you use it for these purposes, having an enhanced trigger mechanism in it is of prime importance. This Glock 19 trigger has been designed with this in mind. The trigger features a full metal body and comes as a complete package, inclusive of the trigger bar. The curved trigger shoe has a grooved design to offer a better grip as you shoot. The model features a simple drop-in design which means easy installation. The trigger has a reduced pull weight, pre-travel and over-travel time. The best part is that the trigger has been designed by Glock itself. So there’s no cause to doubt its quality. The Glock 19 requires a trigger upgrade like this to function efficiently as an EDC weapon. The trigger is economical and easy to install, while enhancing the function of the weapon. CMC is a widely praised name for manufacturing tactical weapon accessories, and this Glock trigger is a testament to that statement. 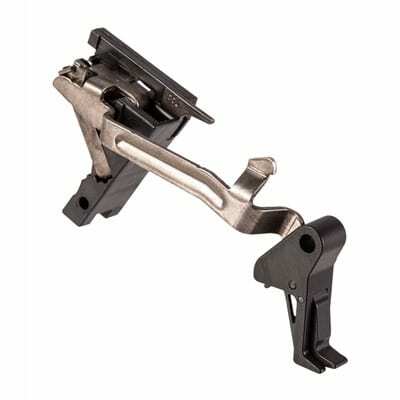 The CMC trigger is a complete drop-in assembly which is easy to install in your Glock. 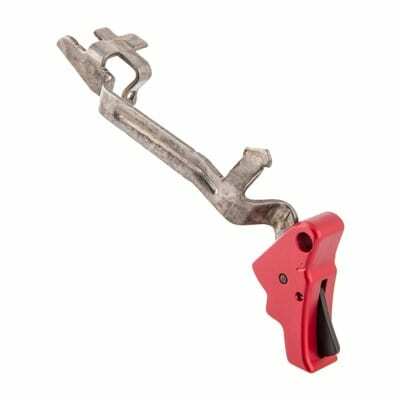 The trigger has been made from 8620 alloy steel and S7 tool steel which already speaks of its durability and corrosion resistance. The trigger has a flat-faced trigger shoe with a hooked bottom for extra grip and control when you shoot. The trigger reduces the pull weight by 2 lbs compared to the original factory trigger and features a positive reset and crisp break to let you shoot precisely. This product has reduced slack (pre-travel and over-travel time) for aiding with the accuracy of the Glock. The self-contained trigger assembly is compact and can be switched among different Glock handguns if you desire. The trigger fits all Glock models from Gen 1 to Gen 3 and also has a separate model for Glock Gen 4 pistols. The finger placement on this trigger is exceptional and keeps the wide trigger safety from pinching your finger. The trigger will definitely improve the performance of your stock Glock pistol. This trigger is light and crisp, which makes it ideal for competition use, range use, and even self-defense. The only drawback of the trigger is its price, which is way above justification, although, this trigger assembly is the complete package, which softens this to some extent. 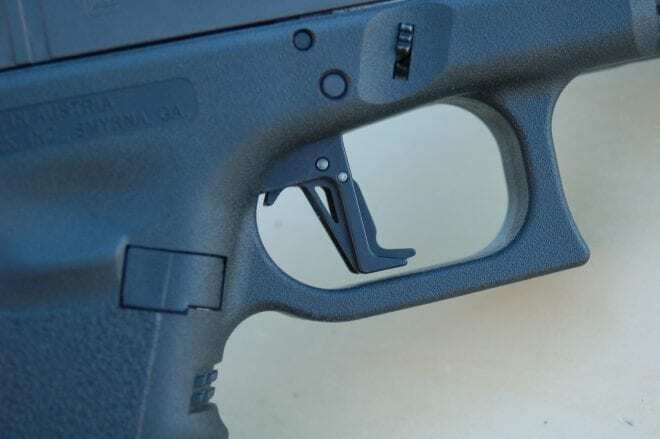 The CMC trigger for Glock is an exceptional aftermarket addition to your Glock. It is good for EDC, self-defense, and competitions. However, the price is a bit on the higher end, so ponder a bit before buying. 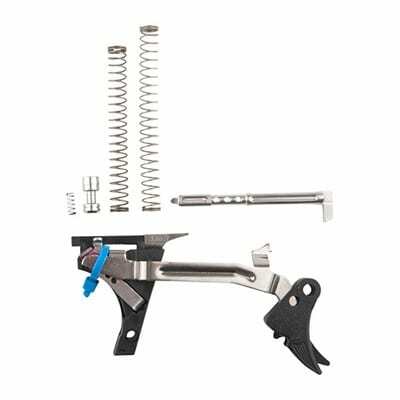 This Glock trigger from Zev Technologies is a complete trigger replacement kit which is fully adjustable in all respects. It has a drop-in type installation for basic swapping. However, if you need to make an adjustment to weight and travel, you ’ll need some specific tools and proper knowledge of the Glock system. The trigger can be adjusted for pre-travel and over-travel using the two easy to access head screws (a wrench has been included in the package for this). Apart from that, the kit contains all the parts and springs to make adjustments to the pull weight of the trigger. The kit also includes a reduced power striker spring to create a lighter trigger for competitions and a factory-weight striker spring for normal use. The trigger features a curved trigger shoe and a hinged trigger safety, both of which have been manufactured from 6061 T6 aluminum. The surface of the trigger bar has been properly polished for effective engagement and flawless operation under all conditions. It features a crisp break and smooth travel. Plus, the reset is also positive, so you can engage the target without much realignment. This trigger will require some skill and time for installation, so be prepared for that. The adjustability of this trigger makes it versatile for almost every other kind of use. You can make adjustments to suit different situations like EDC, competitions, or duty use. The trigger fits Glock Gen 1, 2, and 3 pistols, so be sure to check the model of your Glock beforehand. The trigger kit from Zev Technologies is a complete package which allows adjustability for the trigger. You can adjust the pull weight and travel to suit different use cases. Using the kit requires extensive knowledge of the Glock mechanism, so make sure to have proper guidance while using it. Changing the Glock Trigger is not a herculean task if you know the inner mechanism or follow the instructions properly. The process begins with checking the firearm for safety. Remove the magazine and check the gun to be sure it is empty. Now, push the takedown lever to release the slide and then push all three takedown pins on the Glock out with the help of a punch. The larger pin (above the trigger) is a bit hard to remove sometimes so jiggle the slide stop lever up and down while pressurizing the pin. Now, take out the slide stop lever and pop out the plastic pin with the Glock tool. Next, pull the trigger assembly out of the bottom. Match the cross-shaped section of the trigger with the slit in the block and rotate it slightly to pull it off. Use a punch or screwdriver to push out the trigger bar. Now swap the new trigger, and get ready reassemble the gun. Follow the exact same process of disassembly in reverse order. Finally, cycle the gun while it's empty and pull the trigger. If the striker hits the bolt, your weapon is ready to fire. If some of the steps mentioned in this text-based guide have flown over your head, consider watching this video below for detailed step-by-step instructions. The factory trigger of Glock handguns has a pull weight of 5.5 lbs, which is not always suitable for everyone. Changing to a new and improved trigger aids with accuracy and handling of the weapon. However, you must always look for the quality, compatibility, adjustability, and ease of installation with a trigger guard before buying one.